Bruneian martial arts is not well known. Everyone has their own general visualization in their minds on how silat movements tends to be represented. But not many understands that silat is only a general term to cover the actual fighting methods and that there are thousands of styles with subtle differences. People tend to categorize what silat is, what it should be and how it should be trained; anything outside of this or the instructors personal criteria is anything but silat, disregarding that every country in southeast Asia has its own history and culture. 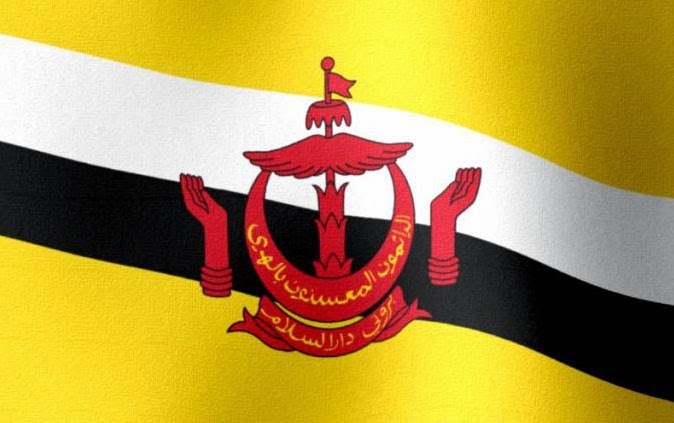 Brunei is one of the oldest kingdom in southeast Asia, founded before the coming of Islam whose name originated from "Varuna" a Hindu Sanskrit text, the oldest text in the word, referring to its "nation of seafarers and traders". Historical findings suggest that the Brunei kingdom began more than 1,500 years ago, pre-dating Islam. Founded by Pateh (or Patih) Berbai and a group of 90 warriors from the Sakai Tribe. It existed side by side during the reign of the Srivijaya Empire of Sumatra in the 9th centrury, the Madjapahit Empire in Java in the 13th century and Parameswara in Malacca in the 15th century. Its earliest existence was believed to be a tributary province of the Srivijayan then the Majapahit Empire. 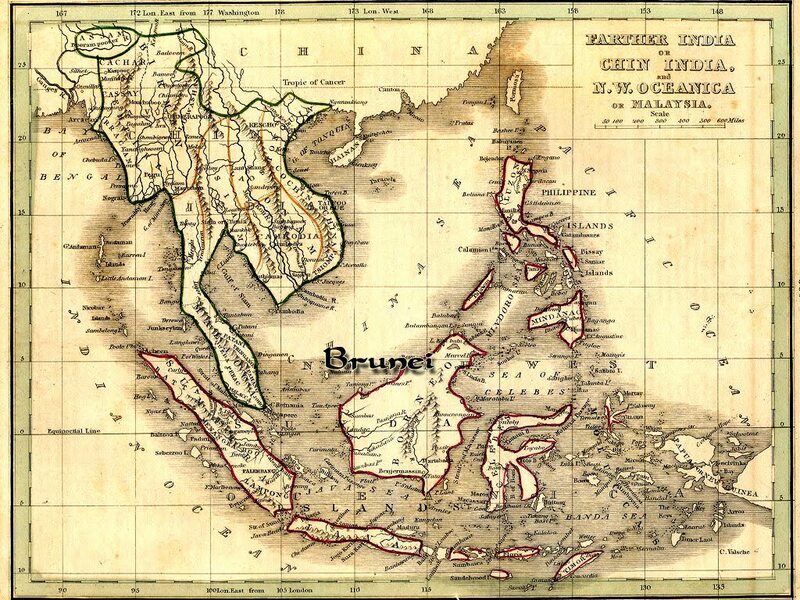 Ancient Chinese texts referred Brunei as either "Pu-ni", "Po-ni", "Pu-li", "Bun-lai" or "Wen-lai" and documented its interactions with the Chinese Empire in the years 518, 523, 616, 669, 977, 1279, and 1369-1643 AD. Ancient Indian traders called Brunei "Sailendra", "Syailendra" or "Syaleindra"; while the arabs called it "Kamrun", "Sribuza", "Dzabaj" or "Randj". "Borneo" has only recently been used as pronounced by Europeans based on the statement by John H. Moor in 1871. In another writing in 1812 by J.Hunt, he says "Borneo was the name only of a city, the capital of the three distinct kingdoms in the island,... The natives pronounce Borneo as Bruni and say its derived from the word "Brani" (Bruneian dialect for "Berani" in Bahasa Melayu) meaning courageous..."
Imperial Chinese texts also indicated that Muslim influence was established in Brunei in 977 AD, and slowly implemented the employment of Arabic characters in Brunei's written language, but before that, Sanskrit was used long before 1370. The early kings of Brunei were called "Sang Aji", or "Reverend Monarch", a title of Sanskrit origin. The Brunei ruling dynasty changed in 1371 when Awang Alak Betatar, a heroic warrior King from a powerful kingdom in western Borneo, married a princess from a neighbouring kingdom and ascended the Brunei throne after gaining freedom from the Madjapahit Empire, took charge of their own territorial responsibility. 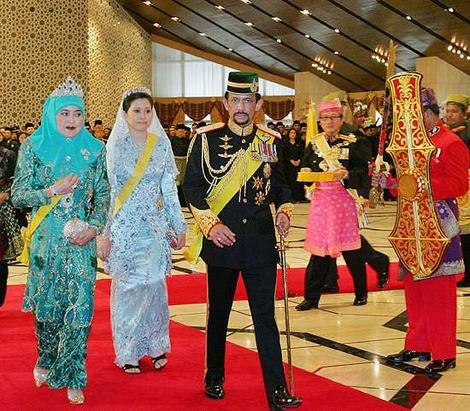 He became the first Brunei ruler and the present ruler is his descendant. Awang Alak Betatar was the first Brunei Raja to accept Islam, changing his title and name to Sultan Muhammad Shah (1371-1402) in honour of the Prophet. Brunei’s sovereignty peaked in the 15th and 16th centuries, when it controlled the whole of Borneo and parts of the Philippines. The kingdom’s vast wealth, derived from international commerce, created a strong impression on early European explorers. They returned to Europe with stories of gold, regalia and majestic ceremonies. The 1st European to visit Brunei were the crew of Ferdinand Magellan's Spanish - backed expedition in 1521, during this time Magellan himself had been slain on the island of Cebu in the Phillipines but his flagship, the Victoria, reached Brunei in 1521. The chronicler of the voyage, Antonio Pigafetta, an Italian from Vicenza, was greatly impressed with what he saw. The Victoria anchored at Muara (a place that still exists today). Pigafetta recorded the splendour of the Sultan's court (gold, pearls the size of hens' eggs, etc), he mentions they were transported on tamed elephants and infront of the Sultans palace, a large brick wall with towers in which mounted 56 bronze and 6 iron cannons, more than 5 times the armament of Magellan's ships, and Brunei exported cloves (an aromatic dried flower buds of a specific tree used as a spice in cuisine all over the world), which were to prove more valuable than gold, upon the return to Spain. Pigafetta mentions some of the technology of the court, such as porcelain and eyeglasses (both of which were not available or only just becoming available in Europe). Keeping in mind Megallan's crew was the 1st contact Brunei had with Europeans, the technology Brunei had were parallel if not encompassing them. Brunei was trading with one of the most advanced trading cultures of that time, China, India, Egypt, etc. No malay nation in southeast asia during that time can claim the fire-arm as being one of thier tradtional weapons other then Brunei. Brunei Cannons known as bedil, as mentioned by Pigafetta are used not just on land but also on board Brunei warships. A record of the Spanish attacks on Brunei stated that the Brunei ships used cannons. The origin of the cannons is unknown, they were already being manufactured in Brunei at least 500 or 600 years ago. Many cannon moulds have been found at archaeological sites throughout the country. The first cannon in Europe probably appeared during the Islamic era in Spain. Brunei cannons are more influenced by our relationship with the Chinese Empire. But like all knowledge from past empires, the knowledge of metal was lost and only a name is left, Kampung Pandai Besi (Village with the knowledge of metal). Some famous cannons bore names, such as Si Tunggal (lit. translation; The One) and Si Dewa (lit. tanslation;The God). These two were taken by the Suluks during the Brunei civil wars and were later taken to Manila. Another well-known cannon during Sultan Bolkiah’s reign was Si Gantar Alam (lit. translation; That which could Shaker of the World) which was used during the attacks on Luzon and Manila. The names of the cannons alone shows the scale of power it must hold in its time. More on Bruneian Cannons HERE. During that time, he art of casting metals had been in existence for many centuries in Brunei. As far back as 1225, a visiting Chinese official, Chau Ju Kua, found that the Bruneians had been carrying swords and metal armour made of bronze when attending funerals. It was said that during the era of Sultan Bolkiah, the fifth Sultan, 40 Javanese metal craft experts had been brought back to teach Bruneians their craft. As the first Islamic kingdom in the area Brunei was the base for the Islamization of the southern Philippines and surrounding areas, frequently coming into conflict with Catholic Spain after the Spanish conquest of Luzon, the central island of the Philippines. In 1578 in the conflict known as the Castille War (Perang Kastila) Spain attacked part of the Brunei Kingdom but was defeated by 100 fierce warriors, together with other locals who were loyal to the Sultan, lead by warriors of royal blood, Pengiran Bendahara Sakam with Orang Kaya Harimau Padang. Spain continued to try to conquer the Islamic Sultanate of Sulu in the southern Philippine islands, finally succeeding in the last quarter of the nineteenth century. The Kampilan and Kelasak one of the weapons in the Royal Regalia, seen here held by the Panglima Askar (lit. translation - Warrior Soldier) on the right of the picture. Bruneian martial arts culture was used effectively within the major history of Brunei, seen perfectly preserved to present day in the Royal Regalia of Brunei's ancient rulers even before the 7th century, to the Castille War (Perang kastila) where the Spanish was defeated in 1578, to the World War against the Japanese. Brunei has strived and continued to exist peacefully due to the efforts of His Majesty the Sultan Haji Hassanal Bolkiah Mu'izzaddin Waddaulah and Yang Di Pertuan Negara Brunei Darussalam; the longest line of reigning rulers that exist in the world today with perfect preservation of centuries of royal heritage. Details of the Kampilan and Kelasak one of the weapons in the Royal Regalia, symbol of perfection of Brunei's Monarch's rich customs and tradition used since its 1st rulers to the present day. There is a legend passed from word of mouth in the Filipino Martial Art Community especially from old master that the Filipino Martial Arts originated from the 10 Datus that came from the kingdom of Bornay. Basically legend had it, Islam came to Mindanao between the years 1240 A.D. and 1380 A.D., spreading to the Visayas and Luzon. It is during these years "Malays" ventured from the kingdom of Bornay (Brunei/Borneo) led by the ten datus (chieftains), the most important of whom is Datu Puti. Datu Puti traveled from Borneo to Panay, from Panay to Luzon, and from Luzon back to Borneo, after helping the datus to settle other islands. In 1433 A.D., Datu Kalantiyaw, the third chief of Panay and descendent of Datu Sumakwel from Borneo, issued civil and social orders called the Kalantiyaw for guiding his people. Although its authenticity is questionable, the eighteen commandments of the Kalantiyaw code may be one of the few written records surviving the pre-Spanish times in the Philippines. It was during reign of the ten Datus (also spelled as Dato, meaning high officials or chieftains) from Borneo the bladed arts Kali or Silat (depending on the tribe dialects) was brought to the Philippines, the forerunner of Arnis in the North, Escrima in its Central and Kali/Silat in the South; was initially taught to the school of Bothoan in the Island of Panay along with academic subjects and agricultural knowledge. The sword used by Lapu Lapu to kill Ferdinand Megallen, descendant of the Datus from Borneo, is the kampilan, kampilan is not used by any other tribes in Borneo other than that preserved in Brunei's Royal Regalia.